... one of the main functions of an analogy or model is to suggest extensions of the theory by considering extensions of the analogy, since more is known about the analogy than is known about the subject matter of the theory itself … A collection of observable concepts in a purely formal hypothesis suggesting no analogy with anything would consequently not suggest either any directions for its own development. 'Operational Definition and Analogy in Physical Theories', British Journal for the Philosophy of Science (Feb 1952), 2, No. 8, 291. 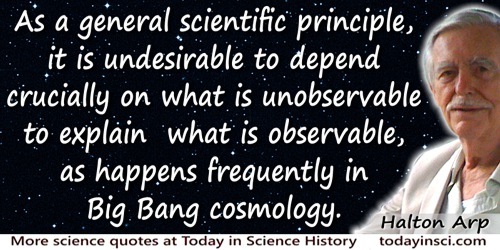 As a general scientific principle, it is undesirable to depend crucially on what is unobservable to explain what is observable, as happens frequently in Big Bang cosmology. In Arp, H.C., G. Burbidge, F. Hoyle, J.V. Narlikar, and N.C. Wickramasinghe, 'The Extragalactic Universe: An Alternative View,' Nature (30 Aug 1990), 346, No. 6287, 812. Every living language, like the perspiring bodies of living creatures, is in perpetual motion and alteration; some words go off, and become obsolete; others are taken in, and by degrees grow into common use; or the same word is inverted to a new sense and notion, which in tract of time makes as observable a change in the air and features of a language as age makes in the lines and mien of a face. It is always observable that the physical and the exact sciences are the last to suffer under despotisms. — Richard Henry Dana, Jr.
To Cuba and Back (1859), 192. There is no end of hypotheses about consciousness, particularly by philosophers. But most of these are not what we might call principled scientific theories, based on observables and related to the functions of the brain and body. Several theories of consciousness based on functionalism and on the machine model of the mind... have recently been proposed. These generally come in two flavors: one in which consciousness is assumed to be efficacious, and another in which it is considered an epiphenomenon. In the first, consciousness is likened to the executive in a computer systems program, and in the second, to a fascinating but more or less useless by-product of computation. Bright and Brilliant Fire, On the Matters of the Mind (1992), 112. Today scientists describe the universe in terms of two basic partial theories—the general theory of relativity and quantum mechanics. They are the great intellectual achievements of the first half of this century. The general theory of relativity describes the force of gravity and the large-scale structure of the universe, that is, the structure on scales from only a few miles to as large as a million million million million (1 with twenty-four zeros after it) miles, the size of the observable universe. Quantum mechanics, on the other hand, deals with phenomena on extremely small scales, such as a millionth of a millionth of an inch. Unfortunately, however, these two theories are known to be inconsistent with each other—they cannot both be correct. A Brief History of Time: From the Big Bang to Black Holes (1988), 11-2. … certain conditions under which the observable thing is perceived are tacitly assumed ... for the possibility that we deal with hallucinations or a dream can never be excluded. In The Language of Modern Physics (1956).